« CC board member v. faculty union? The full letter is here. The Bar’s disciplinary counsel has given Frohnmayer and Gary until 6/21 to respond. The Bend Bulletin reports that the county has spent about $100,000 on the matter so far, presumably much of it to Frohnmayer and Gary’s firm. 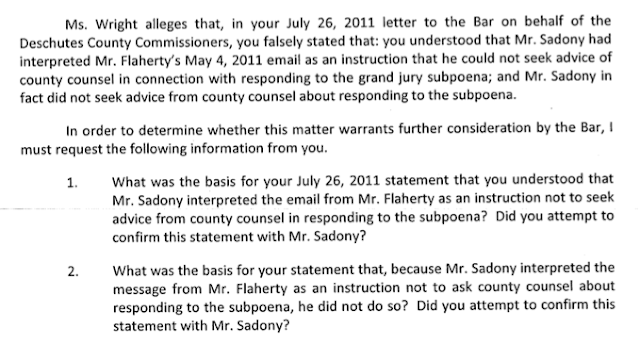 Meanwhile Flaherty has filed a bar complaint against Pilliod. 5/21/2012: The latest Oregon Bar complaint docs are here. Keeping up with Frohnmayer’s ethics issues is a full-time job, I’ve only glanced at these, I think the meat is in the last few pages. 4/21/2012: I’m pretty sure this will only interest my law school readers, at best, but I thought I’d post this Oregon State Bar ethics complaint, filed in March by Valerie Wright against Frohnmayer, Bill Gary, and Deschutes County Counsel Mark Pilliod for the record. It’s a twisted story. The Bend Bulletin has a helpful timeline. Wright is a lawyer and the wife of Deschutes County DA Patrick Flaherty. From what I can tell Deschutes county hired our former Pres at $550 an hour last year to help Pilliod and the county commissioners with a Bar ethics complaint they were supporting against Flaherty, who had opened a grand jury investigation against Pilliod involving a relatively trivial sounding violation of public records law – or maybe I’m jaded. 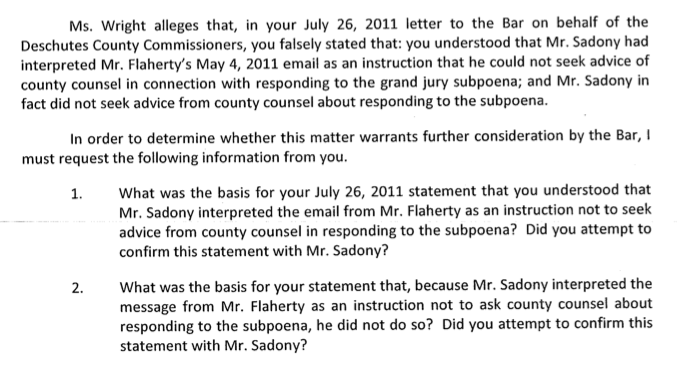 Or maybe this all goes back to Flaherty defeating the commissioner’s favorite longtime DA in an election. Frohnmayer seems to have become a specialist in making ethics complaints against his fellow lawyers – he’s got another one going against Oregon AAG Sean Riddell, apparently payback for Riddell looking too closely at the consulting deals of Kitzhaber’s girlfriend Cylvia Hayes. Tagged Dave Frohnmayer: UO President. Bookmark the permalink. No one would ever accuse Dave of excessive introspection. “Frohnmayer’s latest ethics complaint.” Mr. UOMatters, I’m confused. I was under the impression that EVERY SINGLE ethics complaint you’ve ever filed against Dave Frohnmayer (at least four, I think) was summarily dismissed for lack of merit. Perhaps you can point me to a single ethics complaint, filed by you or anyone else, which led to Dave Frohnmayer being found in violation of an ethics rule? Thank you very much in advance. Four? Well to tell the truth, I’ve sort of lost count myself. But I don’t think any were “summarily dismissed”. And be honest: Don’t you think Frohnmayer might have a few more friends on state and bar ethics boards than a mere blogger like me? Hmm, interesting theory. It could be that Dave has friends. Or, it could be that the state and bar ethics boards consist of intelligent, rational people who are not completely paranoid nutjobs… like a mere blogger like you. I’m sure all Oregon boards are just as intelligent and rational as the OUS board. From Gary Blackmer of the state Audits Division – also a paranoid nutjob? That’s not an ethics complaint, it’s a notice that a contract between Frohnmayer and OUS was deficient under state law. Further, the violation was harmless because it was cured. So if I violate state law but I get caught and pay back the money, that negates the ethical lapse? Wow, that is a different take on ethics. I like it – if you don’t get caught, it’s unethical but so what no one knows. If you get caught, just say “oops” and it’s not unethical. Not sure if you’re a different poster or just a UOMatters guy pseudo; either way, you lack attention to fine detail. The “violation” I was referring to was the absence of a “Return to Work” clause in the contract, and it WAS harmless because Frohnmayer always intended to return to work at UO and did in fact do so. As for the money: Frohnmayer paid the money back as soon as he discovered the overpayment, not–as UOMatters guy claims–because UOMatters guy complained about it. 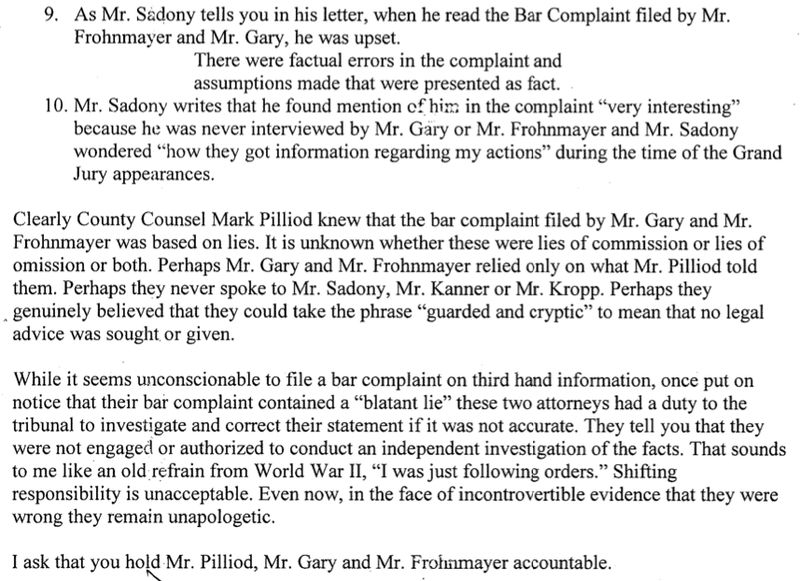 Also–Frohnmayer never committed any violation; the state overpaid HIM. So your sentence, “So if I violate state law but I get caught and pay back the money, that negates the ethical lapse?” is pretty dumb. No offense. You obviously know a lot about this situation – do you know any details about the backdated contract between Frohnmayer and Tomlin? (The first below. The second is his sabbatical contract with Pernsteiner.) Thanks. Seriously, just stop. You don’t know anything about law. There’s no such thing as “backdated” contracts; you’re just confusing that with backdated stock options. You can make the effective date of a contract whatever you want; it doesn’t have to be when you sign the contract itself. The only reason Blackmer even mentioned this in his letter is because you had brought it up and he wanted to appease you/make it seem like he was taking you seriously. But this is not even close to a legal issue/controversy. Please stop embarrassing yourself. So rather than respond to my claim that you lied about about Frohnmayer paying back the money because of your complaint, you delete that part of the thread. I will take that as an admission that you are a liar. Liar, liar, pants on fire. You’re the only one with the ethics problem, UOMatters guy. For the record, I DO give you credit for approving my other posts (note that you don’t need to approve this one). Hmm, interesting thread. It seems that ‘trying to be a pirate and a half’ isn’t always the best fall-back position. OK, I read the state auditors report. This was an unusual deal put together in violation of the regular rules in some ways, and in other ways right on the edge. These arrangements are not unusual, but they are usually kept pretty quiet. There have been a few recent cases from North Carolina and Maryland where the arrangements were exposed in the press and the administrators had to pay back money – hundreds of thousands in the UNC case. The UC system was handing out similar deals 10 years ago or so. The newspapers found out, the legislature investigated, big scandal. While he was on a sabbatical, paid with state funds, he was restarting his legal career at Harrang, Long, Gary and Rudnick. I guess that’s legal too? First, you’re obviously UOMatters guy, not another reader. Second, I don’t know what you’re actually insinuating, nor do I care; either you’re wrong about the facts, or you’re wrong about the law. You’re 0/3 so far in this thread (no ethics problem with the “Return to Work” clause; no ethics problem with the overpayment from the state; no ethics problem with the “backdated” contracts). You have zero credibility. So I’m going to safely assume you’re 0/4 and not waste my time investigating why you’re also wrong about the Harrang stuff. Given that I’ve refuted everything you’ve said with the exception of this last issue, I trust that you now understand the error of your ways and will not repost any of the drivel in this thread ever again? I think ‘UOMatters guy’ is actually also the angry commenter, generously providing us with some wacky free entertainment. Thanks! The problem for Dave’s defenders is the historically erratic behavior of their champion when it comes to matters of law, as illustrated by his difficulties in dealing with the role of the Faculty in University governance. 2. In response to this demand, the Faculty created the “Senate Charter”, which was endorsed by the Faculty in an Assembly attended by fewer than half of its members. 3. Despite the apparent illegality of a Charter created by such an allegedly illegal action, Dave ratified the Charter. Either Dave ratified a document that he knew to be illegal OR he knew that the Public Meetings Law did not apply to UO internal governance. Either interpretation looks bad for Dave. 4. During the next few years, Dave presided over Assembly meetings. During that periiod the Assembly took at least one official action in the obvious absence of a quorum. Makes one think that Dave either understood that no quorum was required OR that he didn’t give a hoot about the Law. 5. Dave unilaterally stopped the periodic Assembly meetings required by the Constitution that he had ratified. 6. When the 500 members of the Assembly convened in 2003 to consider a motion addressed to them by 550 petitioners, Dave refused to recognize the meeting on the grounds that it lacked a quorum, despite the fact that it was probably the best attended Assembly meeting in the University’s history. You got a copy of that ruling on the public meetings law? Any news regarding their reply? “Angry commenter” here. I don’t know anything about any of this stuff. But even if it’s true, I don’t see how it’s that bad; even if it’s that bad, I don’t see how it detracts from Frohnmayer’s accomplishments. Let’s be clear: I’m not against criticism. I’m just against false criticism/lies. And everything I’ve ever read about Frohnmayer on this site has been a lie. In addition to the three things I pointed out in this thread, I also destroyed UOMatters Guy on the Fanconi Anemia/Pat Kilkenny stuff, which was both incorrect and deeply offensive (thankfully, I haven’t seen that discussion pop up again). The “Golden Parachute” stuff that just got re-posted is also BS but I don’t feel like getting into it now. What about you, UOMatters guy? Are you ever going to admit that you’re wrong? It’s already obvious. Me again. You are legitimately crazy. I’m done with you.